Last Wednesday, I was chatting with a librarian about her project cataloguing what are supposed to be rare tune books, hoping that she might have found some from China. Of course, since archival boxes reveal things that aren’t on their labels, as anyone who spends time in archives knows that such boxes are wont to do, instead she’s found many things that aren’t tune books, and sadly also nothing yet from China. To illustrate this mislabeling, she opened up one box with a notation I wondered over and promptly deposited an English Bible printed in 1599 into my surprised and slightly anxious hands. 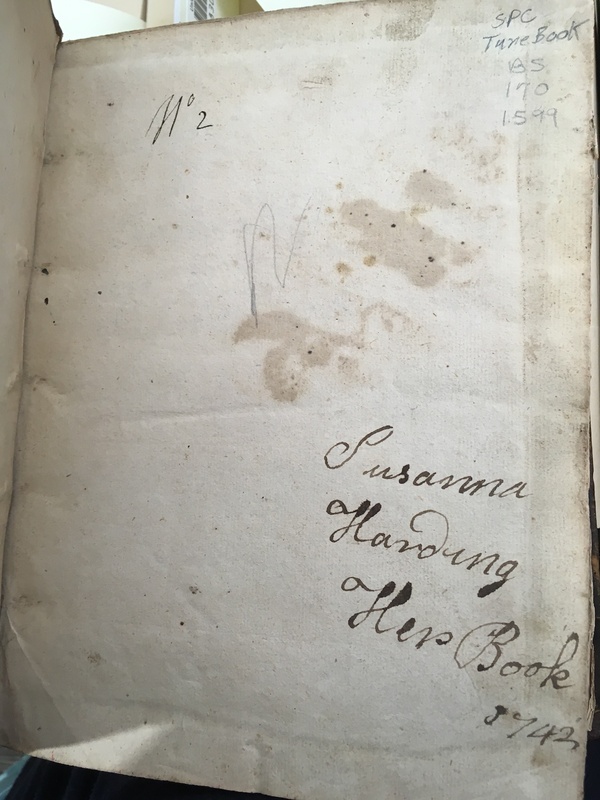 On the next blank page, under the name of a man and a date from 17th century, both of which I’ve already forgotten, Susanna Harding wrote again, this time detailing how much the then-143-year-old book cost her, and the date again: December 1742. I remarked offhand something like “Susanna really wanted us to know this book was her book,” carefully took the two photos above (the one of that beautiful cover page only accidentally capturing two more Susannas in my care not to stress the book’s spine) and handed it back to be boxed up. Not a tune book, just another archival misdirection. You’d think it would be that compact weight of a 16th (albeit barely) century book in my hands that would stay with me, given how little I work with texts so old. From over five hundred years ago into my nervous hands in an air conditioned basement in Colorado. Yet, it’s that 18th century woman (or girl? you’d think an adult might have more circumspection) and her name that comes back to me, day after day, all this past week. Three pages, four signatures. Susanna took up space for herself on these pages again and again and again. Susanna wanted someone to know this was her book. I spent all afternoon today in the library skimming through a reprint collection of Ming and Qing official documents relating to Taiwan, looking for 辜婦媽、陳守娘、黃寶姑、and 寧靖王’s 五妃 in official documents of the 17th, 18th, and 19th centuries. Of course, I found not one of these eight women today, though I have my hopes that 陳守娘’s murder and the subsequent disorder it was said to have caused might be in one of the books I have to request via ILL. I swore under my breath in the stacks when I discovered this 30 volume gap in the Taiwan documents collection. Yes, I do already have descriptions of all of these women from multiple other 18th and 19th century sources. So why am I looking for them. What am I hoping to find? All this work and I may never feel as close to these women as I was to Susanna Harding, and the weight of that book, her book, in my hands, last Wednesday.